Survivor: Tocantins (2009) - 5th out, 12th place. 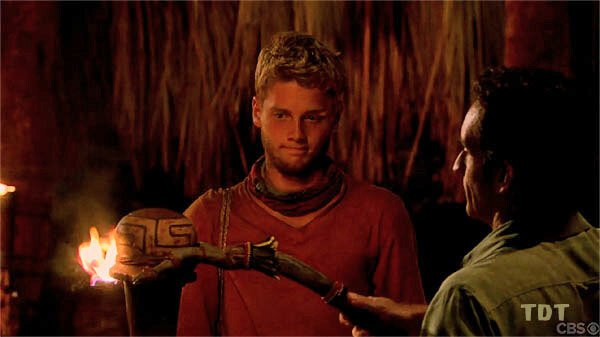 Voted out in Episode 5, "You're Going to Want That Tooth" (Day 15). Tocantins Ep. 1 RC/IC: "A River, Run Through It" - Tries to work the table maze with Sydney, but blows an early lead, to lose to Timbira. Tocantins Ep. 2 RC/IC: "Beach Brawl" - Competes in one match, and Jalapão wins. Tocantins Ep. 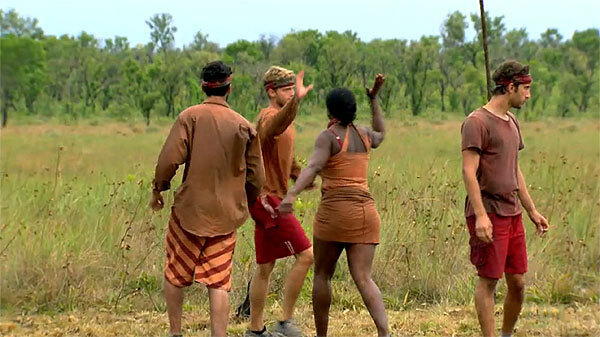 3 RC: "Blind Leading the Blind" - Paired with Stephen, Jalapão wins. Tocantins Ep. 3 IC: "A Crate Idea" - Rolls crates, and Jalapão wins (barely). Tocantins Ep. 4 RC: "Shoulder the Load" - Sits out (with Stephen), as Jalapão eventually wins. Tocantins Ep. 4 IC: "Try Any Angle" - Retrieves a puzzle piece, but Jalapão loses. Tocantins Ep. 5 RC: "Dizness As Usual" - Beats Erinn, scoring the first Jalapão point in a 3-1 Jalapão win. Tocantins Ep. 5 IC: "Water Mortar!" - Fails to effectively guard Tyson, and Jalapão blows a 4-2 lead to lose, 5-4 (as shown, at least). Tocantins, Ep. 1: Carolina Eastwood (voted out, 7-1). Tocantins, Ep. 4: Sandy Burgin (voted out, 5-1-1). Tocantins, Ep. 5: Five votes, from JT, Stephen, Taj, Joe, and Sydney (voted out, 5-1). Day 2. Where *did* Sandy go? Helping catch bait fish, early Ep3. Really enjoyed the letters from home. Andy Dehnart at Reality Blurred (2/11/09): "Spencer: 'I want to be a follower, because that way they just overlook me'"
Andy Dehnart at Reality Blurred (3/13/09): "JT loses a tooth and Spencer goes home, but not because of his challenge performance"
Gordon Holmes at XfinityTV.com (3/13/09): "Castaway Interview: Spencer Duhm"
Tim Molloy at TVGuide.com (3/13/09): "Survivor Fanatic Guesses His Legacy on the Show"
Carrie Bell at People.com (3/16/09): "Survivor's Spencer Thought He Was 'Extremely Safe'"
Thanks to Muneeb Khan (@MUK734) for his help in compiling these links. "Soon to see his teenage years in the rear-view mirror, Spencer Duhm is ready to look forward to the journey ahead of him. A fan of Survivor since day one, which began when he was still in grade school, Spencer can practically do a Castaway roll-call all the way from Survivor: Borneo. His fanaticism will give him a built-in edge that can make a direct contribution to how far he goes in this game. Born and raised in Lakeland, Florida and currently a student at the University of Florida, Spencer majors intelecommunications and minors in business and European union studies. Aside from being the recruitment chair for his UF crew team, where he also rows competitively, Spencer is a huge sports fan. Involved in myriad athletic activities since age 7, Spencer has developed a strong competitive streak and determination to achieve success. Rooting for his college Gators or beloved Cubs familiarized him with all of the peaks and valleys associated with being a contender, which may help him navigate the ups and downs associated with castaway life. With a resume like his, it’s no surprise that this self-professed lover of "water cooler gossip" can't stand slow-talkers or laziness and is very ambitious and very outgoing. He is even willing to face his fear of heights for one million dollars but there is one fear that he refuses to face. When asked what he would not do for a million dollars he responded, "Snakes in general, I just don’t do snakes." This young, goal-oriented man has been presented with his childhood dream of competing on his favorite reality show and truly feels that he has what it takes to become the next sole Survivor. Spencer is a gay, single man and currently resides in Gainesville, Fla. His birthday is December 20."